The use of a treadmill lets you burn calories and stay on tracking with your training even when running outside isn’t an option. But, is treadmill running actually an effective form of exercise? And how accurate are treadmill calorie counters? Can you really trust the numbers reflected in the machine? How can you improve these estimated values? Read on to find out! If your goal is to lose weight, you must establish a negative caloric imbalance. Put more simply, this is done by burning more calories than you take in. Whether this is done passively through eating better, actively by burning more calories, or, best, through a combination of the two, the negative calorie imbalance is the key. Once your body is in the state of negative caloric imbalance, it makes up the calorie deficit by burning fat present in your body. When done healthily through a mix of diet and exercise, this creates healthy, sustainable weight loss and lower body fat. When you exercise on a treadmill, you burn extra calories, which can contribute to the total amount of calories burned, leading to a negative caloric imbalance. What Determines the Calories Burned on a Treadmill? The muscles of your body burn energy – calories – to move your mass a certain distance. The higher your weight, the more calories are burned per mile or kilometer. This is a little bit tricky. Your speed is a combination of stride length and cadence. That is, how long each step is, and how quickly you take steps. Longer strides require more energy, so you would burn more calories. But that is also a less efficient way to run and might slow you down. With shorter strides, you’ll take more steps, which conserves energy so you’ll be able to run farther. But to maintain speed, you’ll need to increase your cadence. Either way, you’ll burn about 100-150 calories per mile. The smoother the motion and the more trained you are in using the treadmill; the fewer calories you will burn at a given distance. These may vary by individual as there are speeds that are more natural and effective to some. At an increased speed, running tends to be more naturally efficient as compared to attempting a fast walk or a race-walk technique. If your heart and lungs are working harder, it’s because your body is burning more calories. Your heart rate and breathing speed up as your body needs more oxygen during exercise. Keeping an eye on heart rate and breathing is a great way to monitor the effort you are putting in. If you are covering the same distance in a shorter time, then you are not only burning more calories due to the intensity of your workout, but also burning calories by just breathing and existing. Overall, the net effect will be more calories burned. Without getting into the physics of potential energy, just know that running uphill is harder than running on a level surface. You probably know this intuitively from taking the stairs to the fourth floor, or from hiking that mountain. The same hold true on a treadmill. You are working harder because you are lifting your body up, not just moving it forward. In fact, you’ll be able to burn an extra three to five calories per minute depending on the settings of your incline. A motorized treadmill has a moving belt and smooth surface that reduces the number of calories burned at a given distance as compared to no-treadmill exercises. Why is this the case? Well, the motor is doing a good portion of the work. The difference between the calories burned can be made up by setting up the treadmill to at least one percent incline. Fewer calories are burned if you get support from the rails while walking or running on a treadmill. The calories burned per minute is primarily based on the above factors, with speed and stride length being the most important. The distance that is covered at a certain time will also be a great factor in determining the number of calories burned when using a treadmill. Treadmill lovers have all the reasons to smile! Experts agree that the calorie counter in a treadmill is accurate enough for government use if you input your weight prior to working out. This weight-factoring will provide a more accurate result, since the burning of the calories is closely tied to one’s weight. On the other hand, a treadmill that doesn’t ask weight will use a standard weight reference, usually 155 pounds. This will calculate the burned calories based on the weight that might be more or less than the actual, thus giving you inaccurate results. Improper posture during walking or running on a treadmill will also affect calorie reading and accuracy. 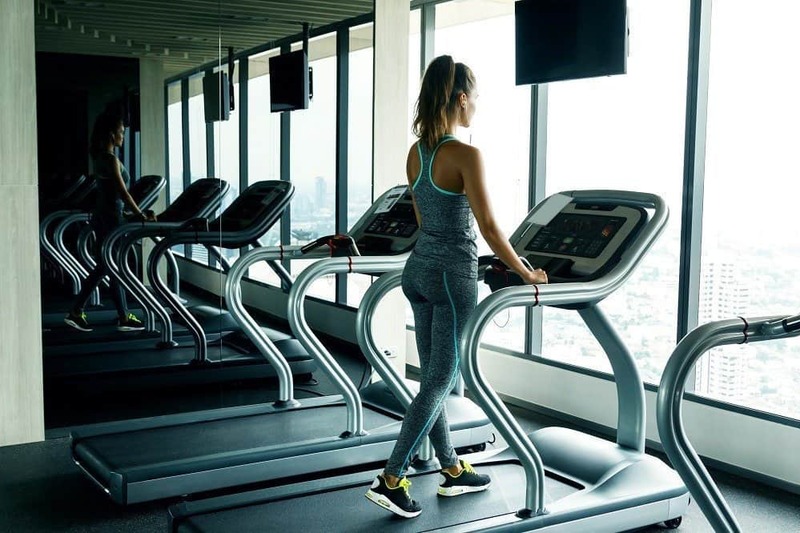 According to some research, leaning on the treadmill’s handrails, especially with higher speed and inclines, tempts people to support some of their weight with their arms. This effectively makes you weigh less (at least from an exercise and calorie-burning perspective). In turn, this can decrease the calorie burn by as much as 40 percent! However, the machine won’t indicate or reveal this difference. As a result, you’ll burn fewer calories than what the machine will display at the end of your session. Don’t let your treadmill’s lack of weight inputs and questions such as “How accurate are treadmill calorie counters?” be your excuses to avoid a workout. Instead, take the calorie reading to the next level. Try to determine a reasonable estimate of calories that you burn by using an online calorie calculator. This will ask you to input data, such as your weight and workout type, and then determine your calorie burn online. Be sure to use this information as you continue with your routine. The use of a heart rate monitor connected to the treadmill will greatly improve calorie estimates. Together with accurate weight and speed, the best estimate of calories burned should be produced. Some treadmill machines sync to wireless heart rate monitors, while others have monitors built into the grips of the machine. You can also use finger or ear clips for better reading of your pulse rates. Experts suggest that it is best to avoid using the handrails, and always practice good posture to maximize your treadmill time. Slumping over the treadmill can make your workout harder in several important ways. And besides: good form is always important. If possible, run outdoors, as this is more challenging for the body. The distance, speed calibration, and physical stress of an outdoor workout are, in general, more effective than treadmill miles. If you lack time to run outside, then try going a little farther and longer with your indoor session to make up for the terrain difference. You can also practice fat-blasting interval routines to achieve better results. The use of wearable fitness trackers is also a great option. These sleek-looking gadgets will let you input all your activities for better tracking of calories in and calories out. Some can also monitor your heart rate, giving an excellent option to reach not only your fitness goals but to improve your overall health.